Quick, easy and loaded with flavor. 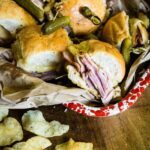 These Party Time Hot Ham and Cheese Sliders are perfect for feeding any crowd. Slice the rolls in half and place on a baking sheet. Whisk the mustard and mayo together in a small bowl. Spread evenly over the bottom layer of the rolls. Fold and stack the Prime Fresh Smoked Ham onto the rolls. Add the layer of cheese. Place the top half of the rolls back on top. Whisk the pepper into the melted butter and brush evenly over the top. Bake for 10 to 15 minutes until the buns are toasted and the cheese has melted.